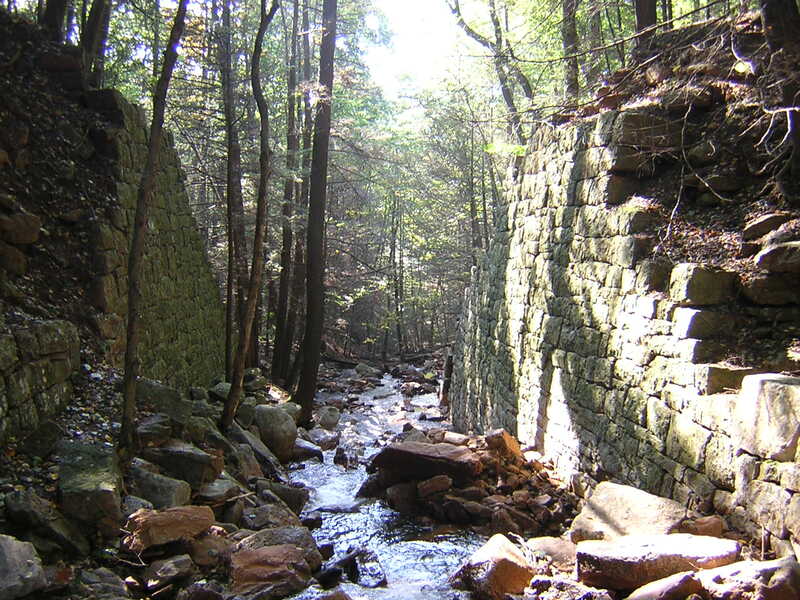 Bridge piers for Summit Siding next to Gold Mine Run (Left) and Rausch Creek (Right). The original line of the Dauphin & Susquehanna Railroad was constructed from 1850-1852 from Dauphin to Gold Mine. 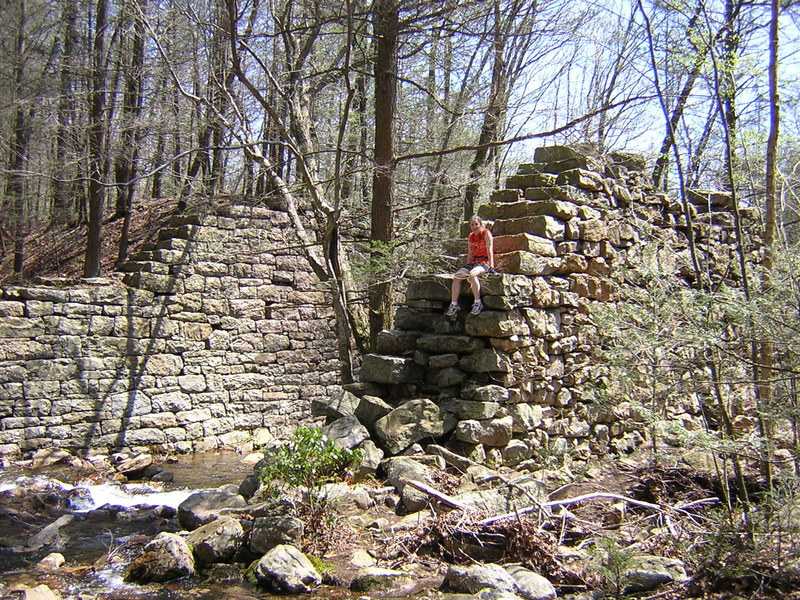 In order to cross Rausch Creek and Gold Mine Run large bridge piers were constructed on either side of the creeks. These bridges were constructed entirely by hand and a crude new hoisting machine and presumably without the use of mortar. 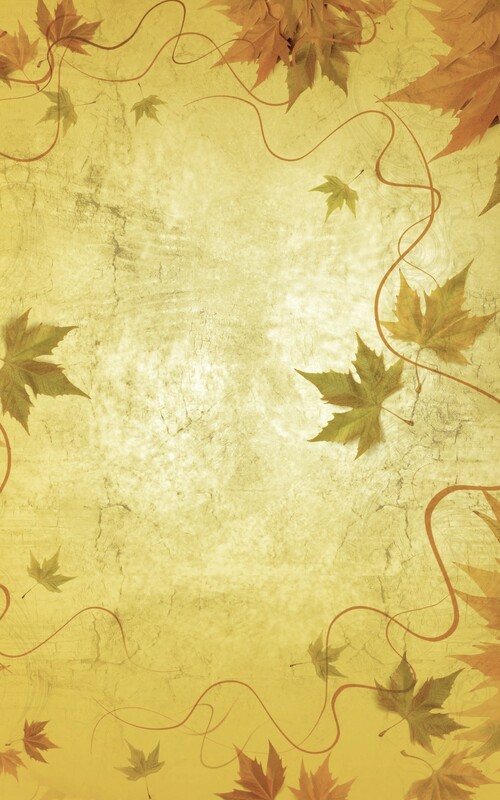 The rocks were taken from the town rock quarries, and drill marks can still be found in these stones today. When the railroad was finally constructed to Auburn, Schuylkill County in 1854, the original line from Rausch Gap to Gold Mine was made a siding dubbed either the Gold Mine Siding or more commonly Summit Siding (since Rausch Gap, where this new siding joined the mainline, was the highest mark on the western end of the railroad). The steam trains carrying coal from the Gold Mine and Rausch Gap collieries continued into the 1860s, when the siding was finally taken out. By the time motorized vehicles appeared, Summit Siding was used to haul out truckloads of coal from bootleg (or illegal) mining operations during the Great Depression. DIRECTIONS: Park at the Goldmine Trail trailhead (continue north on Gold Mine Road from Route 443, past the rail-trail parking lot. Trailhead parking is just across Evening Branch of Fishing Creek). Walk up Goldmine Trail. On the righthand side as you begin to crest the first rise of the mountain there will be a wall, and on the left will be a wide trail. This is the upper rail-trail (a sign on a nearby tree will confirm). This trail will take you over Gold Mine Run and into Rausch Gap, taking about 3.5 miles to do so. 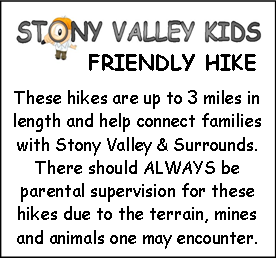 The walk to the first of the bridge piers at Gold Mine Run is suggested as a "Stony Valley Kids Friendly Hike," whereas the trip to Rausch Gap should be reserved for older children.